I try to stay as active and in shape as possible. Running is definitely one of my favorite recreational activities to remain active. In the heat of the summer, I find myself slowing down on miles for several reasons. 1: Being MN blood, my body accommodates to the cold much easier than the heat when exercising. 2: There are just too many weddings, cabin weekends, and beach days to distract me from getting out and running longer mileages. One thing I have discovered that helps me retain and re-spark my love for getting out onto the trails is reading books about running. I have two in particular that I love, and have actually read both twice. The first book I read when I was still in PT school, almost 4 years ago now. I was training for the first half marathon that I would actually run and finish (I trained for 2 before I actually got the guts to get to the starting line). This book provided me great inspiration during my training. “Born to Run” by Christopher McDougall was a book I had heard about from a friend I was training with, and it is definitely one of the more popular books within the running world. It is most famous for starting the bare foot running craze. The book starts by the author describing his struggle with injury, and the fact that he was just a “normal” 3-5 mile runner. This drew me in instantly for 2 reasons: 1. My interest in injury, and 2. I had not yet finished my first half. It goes on to follow his search for a tribe of ultra-marathoners in Mexico, and how it impacted his journey to distance running himself. I enjoyed this book so much, that I bought it on audio books to listen to while I am increasing my mileage when training for a race. The story line drags you in, and the inspirational pieces and running tips are enough to make you want to get out on a rugged trail yourself. to enjoy this book because Scott Jurek is originally from Minnesota. He does a fantastic job of building the story of his success from the bottom up. He also helps to relate running success to general success not related to sport. My favorite part of the book was how he sprinkled in vegan recipes. I do not follow a vegan diet, but love and appreciate learning about wholesome, healthy food. The toughest part about eating healthy is often times having good ideas and recipes that fulfill your taste buds. I use his guacomole recipe quite often during the summer months, and it is easy and delicious. There is so much more depth to this book than just recipes. The author’s honesty about his early life provides great inspiration to anyone who encounters obstacles on the road to achieving their goals. I’m currently planning for my upcoming wedding, and am looking for more inspiration to keep running despite the time constraints that busy life provides. 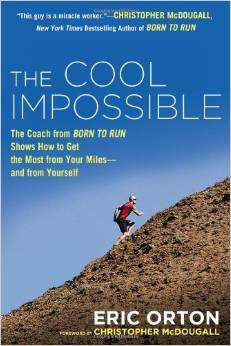 The next book I plan on reading is titled “The Cool Impossible” by Eric Orton. What are your favorite books for inspiration to stay active? I would love to get more ideas, so leave me a message with your favorites. Thanks for reading, look forward to hearing about new fantastic books!